Fresh off a solid 2014 that saw it make two big acquisitions and gain real estate investment trust status, Edgefront REIT (ED.UN-X) this year has set its sights on gaining investor respect and attention by upping its pace of acquisitions. The Calgary-based industrial REIT said publicly it is disappointed with the valuation it has been handed by the market earlier this month when it released its year-end numbers: “Our quarterly and 2014 full year results further reinforce our belief that Edgefront is currently being undervalued in the marketplace,” stated Kelly Hanczyk, the REIT’s president and chief executive. In an interview, he went a bit further in explaining his stance. “From a pure yield standpoint, we have the highest yield. We have probably got one of the lowest payout ratios and one of the lowest debt to GBV (gross book value) and one of the lowest, or the lowest, price to AFFO (Adjusted Funds From Operations)” ratios. How much of a discount does Edgefront trade at? Hanczyk noted the REIT’s net asset value is approximately $2.05 per share, compared with a trading price in the $1.70 to $1.80 range. Call it roughly 10 per cent. While it has a low profile with investors, Edgefront was fairly busy on the acquisition front in 2014, snapping up 13 industrial properties in two transactions totalling $104.7 million. This year, it hopes to achieve a similar level of activity. Hanczyk believes activity in the market is both picking up and trending in its favour, most notably in the secondary market it favours. Edgefront has something of an ace in the hole in terms of its acquisition strategy: its reliance on a sale-leaseback acquisition model that has proved popular with the business owner vendors it has targeted. Those sellers who are now approaching Edgefront more and more rather than having to be sought out, typically take part of the sale payment in REIT units, which helps the Calgary company’s debt and cash position. Under its sale-leaseback model, Edgefront aims to pay between 40% to 50% of the price of its acquisitions in trust units. The strategy helps with the REIT’s goal to keep its debt to gross book value around 50%. Currently it is at 48.8%. Another benefit of the arrangement is that sellers who turn into tenants are only too happy to stay in their buildings. Edgefront’s occupancy rate stands at an impressive 100% and is likely to stay at that steady state level. Who are the targets for the REIT’s sale-leaseback deals? Solid companies with a proven track record. “It is companies that we know, we know their business . . . that have been around for a while, that are successful, have pretty strong balance sheets,” said Hanczyk, “and they just might want to take the money out of the real estate and redeploy it into the business. 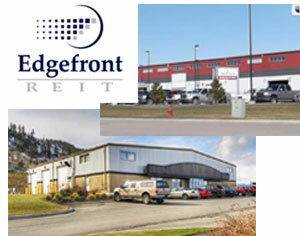 Essentially, Edgefront has miniaturized the process the likes of Loblaw Cos. (L-T), Canadian Tire Corp. (CTC-T ) and Empire Co. (EMP.A-T) carried out when they transformed their real estate holdings into REITs. Instead of vast holdings, Edgefront is freeing up real estate a building or two at a time. The other part of Edgefront’s model, the use of REIT equity, can also be used in more conventional deals, Hancyzk explained. Just how much Edgefront can acquire this year will depend on the appetite of the financial markets for real estate deals, said Hanczyk. “I would like to think we could do somewhere between $70 million and $100 million. That would leave Plan B for 2015: relying on sale-leasebacks to grow the asset base, a building by building approach. While very much in acquisition mode, the REIT does have two assets poised for a turn on the auction block: namely 139 Douglastown Boulevard in Miramichi, a 28,950 square foot, two storey class-A office property; and 695 University Avenue in Charlottetown, a 4,500 sq. ft. retail property currently leased to TD Bank. The two East Coast properties are legacy assets, part of Edgefront’s initial qualifying transactions when the company intended to create a diversified REIT.